Johnson caught 92 passes for 1831 yards and 20 touchdowns in college and was co-MVP of the 2002 Rose Bowl along with QB Ken Dorsey. He entered the 2003 NFL draft following his junior year and was chosen by the Texans with the third overall pick in the first round. With excellent size and speed, he moved directly into the starting lineup and caught 66 passes for 976 yards (14.8 avg.) and four TDs in ’03. He also proved to be effective after the catch and a fine blocker. Johnson followed up with his first Pro Bowl season in 2004, with 79 receptions for 1142 yards (14.5 avg.) and six TDs. While he continued to develop in ’05, Johnson missed three games due to injury and his productivity slipped to 63 catches for 688 yards (10.9 avg.) and two scores. Texans went 6-10 to finish fourth in the AFC South. A promising 2007 season ended due to a knee injury after nine games, but he bounced back to lead the NFL in pass receptions (115) and receiving yards (1575) in ’08 and received consensus first-team All-NFL honors for the first of two consecutive years. 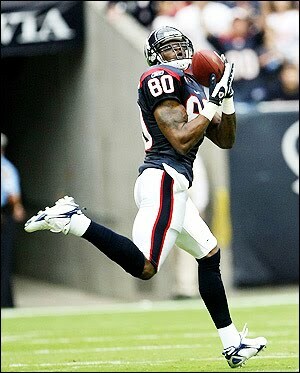 Johnson led the league in receiving yards again in 2009 (1569) and had a third straight Pro Bowl year in 2010 despite suffering from a high ankle sprain and missing two games. Hamstring problems cost him nine games in 2011, a down year, but he rebounded with Pro Bowl seasons in 2012 and ’13 in which he again went over 100 catches and 1400 yards. Overall, through 2014, Johnson has caught 1012 passes for 13,597 yards (13.4 avg.) and 64 touchdowns, with five seasons over 100 catches and three above 1500 yards. He has been a consensus first-team All-NFL selection twice, received at least second-team honors after three other seasons, and has been selected to the Pro Bowl seven times.